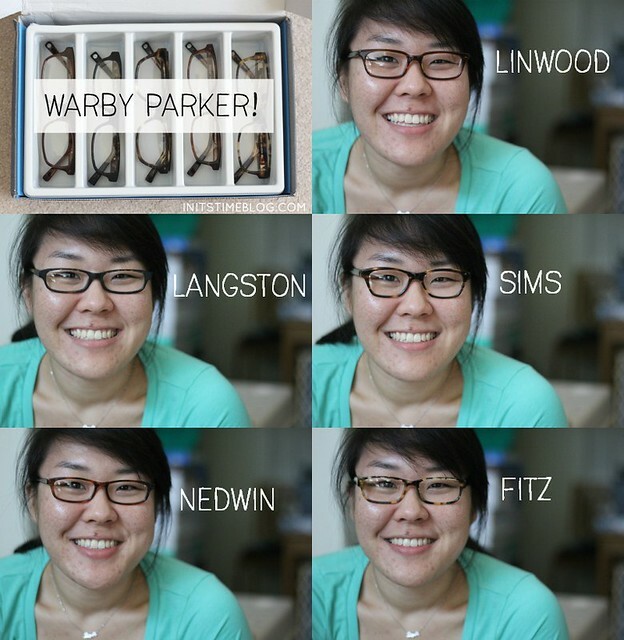 HELP A BLOGGER OUT | WARBY PARKER! If there's one thing bloggers have besides cameras and domains, it's cool blogger glasses. You know what I'm talking about, the cute larger-framed wayfairer glasses. I've had my eye on them for years (read: years) but because of insurance and expired prescriptions, I never got to buying any. But now that I've got a job, and a new prescription, I've been on a glasses hunt. I'd love to have a cute new pair of glasses and that's when this tweet and later a late-night order from Warby Parker happened. Most of you have probably heard of Warby Parker, which is an online eyeglasses company where you can order a free(!) at-home try-on set of 5 frames of your choosing. And since lots of my blogging friends (shout out to Anne, Julie, and Meg!) have tried and loved their Warby Parkers, I thought I'd give it a try. After all, it is free. So I've picked out five frames and I'd love your input! As soon as my package arrived, I quickly opened the package and fell in love with all five frames--they're all so pretty! My mom, sisters, and I all tried them on (yep, they did, too! ), stared at the mirror, and narrowed it down to a few frames. Of course, I should probably note that my lovely wide face isn't loving all of these frames (anyone else have these problems? ), but I'm hoping a quick visit to my optometrist's office can help with that. So help a blogger out and let me know what ones you like best! They're all pretty similar. But, let's go with Linwood? Fun to see what other people pick to try - I was fixated on more of a round shape, so most of these weren't even on my radar when I was looking through the site! And I say Linwood - I like Fitz too, but I think the color of Linwood looks good on you. I like Linwood and Fitz! Probably because they look similar to the frames I wear, hahah. i like linwood & fitz! That's so nice of you to say that! My round face can't do round frames, though. :) And I love the Nedwin, too! I'm down to two frames and that's one of them! Linwood is one of my faves! And it's funny, because two of the frames I picked out ended up looking A LOT like my current pair. It's funny how that happens, right? That's how I feel! If my face wasn't so round, I definitely would have tried the rounder frames. :) And it's funny that you mention the color of the Fitz--they were out of stock in their at-home try-on frames in the color I wanted (it looks a lot like the dark brown color of the Linwood). I wanted to get them anyway to complete the box and just see what it looks like but the color is so distracting that I can't tell if I don't like the shape or the color, haha. But the Linwood is one of the two I like best--I still can't decide which ones to get! I love the Linwood, so I'm glad you agree. Thanks! I love the Linwood, too! It's actually one of my top two picks. :) And I agree, they definitely are the best frames for my face. If the Fitz didn't come in that frame color and was a little wider fit-wise, I definitely would have considered them! Too bad they didn't have the color you want - I find it sooo hard to imagine a different color when they're on my face. That out of stock business happened with a few things I wanted to try too. Not sure if just waiting it out for a few days might mean they come available again? I like Langston and Linwood! Yay! Sounds like you made your choice. Wish I could have bought from Warby Parker (the company started at my school), but they don't ship to Alaska (boo!). I think the Fitz looks beautiful on you!! I have a round face too, so I hate trying on glasses. I'm super envious of people with petite faces that can pull off anything! :P But if the Fitz comes back into stock with the color you originally wanted, definitely go with those! (Or whichever glasses you feel best in!) I need new glasses also, so I've definitely been thinking of trying out Warby Parker. I think I've changed my mind....I like nedwin too. but maybe linwood. GAH this is too hard! You're telling me!!! I keep going between Nedwin and Linwood. The Nedwin frames are a lot like my current frames and I've been trying to branch out (which is why I like the Linwood frames). But then I look at the Fitz frames and start to like them more, too--except the frame color. It was the only color in stock and I really wish I had waited because the other colors are wayyy better. Yay! I'm so glad you decided to get one! I definitely have a round (wide!) face so I'm always envious of those people who can wear any glasses. Some of the frames were a little tight on me but I'm pretty sure they can be adjusted at an optometrist's office. My top two are Linwood and Langston! But they're all so cute! I love the LANGSTON frames on you the best! Linwood is my fave right now! :) The Langston frames are a fave, but they're a lot like my current pair and I've been wanting to branch out. Thanks for your input! It's been so much fun to hear everyone's opinions. Me, too! I just checked and it looks like they're back in stock to try at home. It's funny because every time I think I've made up my mind, I go back and waver between another pair. :) Why is it so hard? Warby Parker started at your school? That's awesome! And that's really too bad they don't ship to Alaska--I'm surprised they don't! Well, they ship, but they don't do the at home try-on program... and glasses are something I can't quite justify ordering online unless I can try them on. And yeah! The company was started by a couple Penn students, so they are popular at school. I have never heard of Warby Parker. How awesome! I love the LInwood on you but they all look great! I love the Linwood, too (psst, I think they might be the winning pair!). 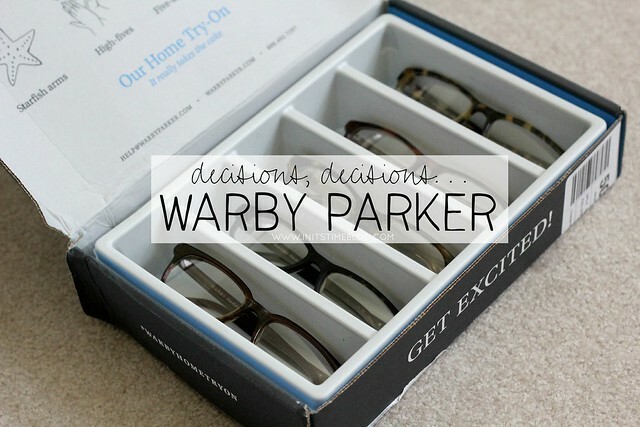 Warby Parker is an awesome company and if you're ever shopping for glasses, I definitely recommend their at-home try-on boxes. They're so much fun! I like the Langston best, but I like the Nedwin too. They're all cute, though. If you can, I would take them all to your optometrist before returning them, just to make sure they can be adjusted. You don't want to repeat the process! Not too late at all! I'm still torn between Fitz and Linwood and I'm thinking I might want to order another box because I still can't make up my mind. I love the Linwood but I also liked the Fitz (especially the other colors they come in).